I’ve been writing a lot about values and vision lately over on the Thoughstream blog and that got me thinking about this really cool (to me) equation I learned in while taking the Provincial Instructors Diploma Program (PID) at Vancouver Community College… eons ago. I actually hunted around for quite awhile looking for this equation. I even went so far as to post a plee for help in finding it, on the Facebook page for the PID program. Now that I’ve found it, it’s not quite a fantabulous as I recalled but it’s still pretty cool so I thought I’d share it. The most often used example of this equation in action is the pro-life debate. The vast majority of people are “pro-life”, that would be the moral standard. Most people believe life is “good”, they value it. 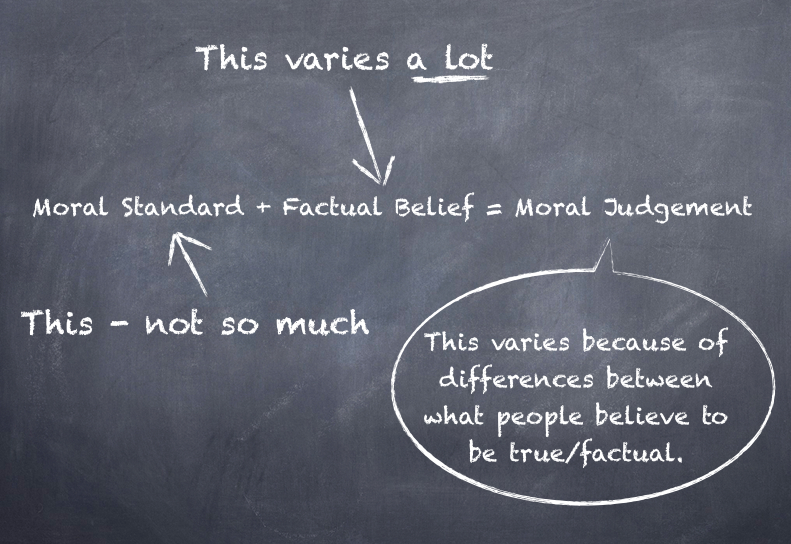 Where people differ is in their understanding and belief of the “facts”. Some people believe that life begins at conception or before and other believe it begins at some other time. What you believe to be the “truth” determines your moral judgement around abortion. What we believe to be the truth is usually influenced by our culture, our upbringing and what our peers ascribe a “the truth”.